Cluster research is often the hammer needed to break down brick walls. In “Neighborhood Reconstruction: The Why and How,” Jean Atkinson Andrews, CG, discusses the benefits of this type of research and how to approach it. In “Buried Treasures: Finding Records in Unexpected Places,” Pam Vestal explains how we can find valuable family history in places we might not expect. FGS Member Society Leadership: The main contact, delegate, and other board members for FGS member societies and family associations can access the magazine by logging into their account at fgs.org. After logging in, click on “Access FORUM Subscription” or “Access Members Only Benefits > FORUM Archives” to access the magazine. If you are the FGS delegate or a board member for a member organization and have not received a login, please contact the person in your organization who manages the FGS account. If you don’t know who that person is, contact info@fgs.org. FGS Associate Organizations: The main contact for FGS associate organizations can access the magazine by logging into their account at fgs.org. After logging in, click on “Access FORUM Subscription” or “Access Members Only Benefits > FORUM Archives” to access the magazine. FGS FORUM subscribers: Subscribers can access the magazine by logging into their account fgs.org. After logging in, click “Access FORUM Subscription” to access the magazine. Who can subscribe to FORUM? Anyone. 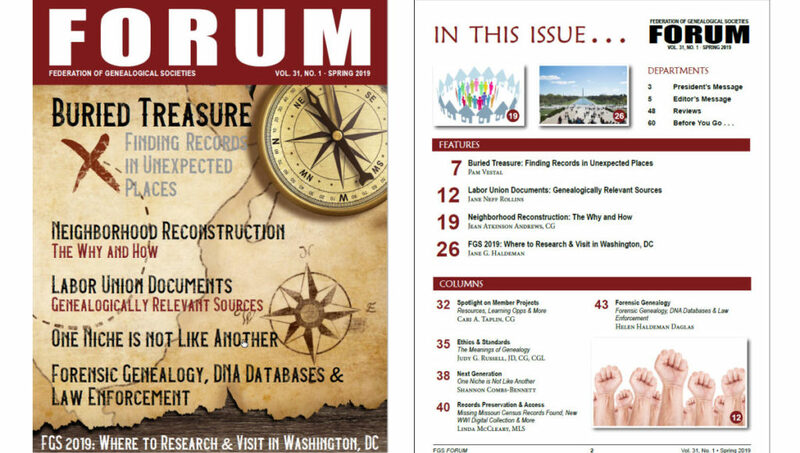 You don’t have to be a member of a genealogical society to subscribe to FORUM. Please note that if you are currently the FGS delegate for or serving on the board of an FGS member society or family association, you have access to the magazine through the organization’s FGS membership and do not need a subscription. Genealogical Society Leaders: If your society is not a member of the Federation of Genealogical Societies, become one today and let your society’s leadership begin accessing FORUM and its 25+ year archives, which is just one of the many benefits of FGS membership. Is the Forum magazine available at bookstores or newstands?